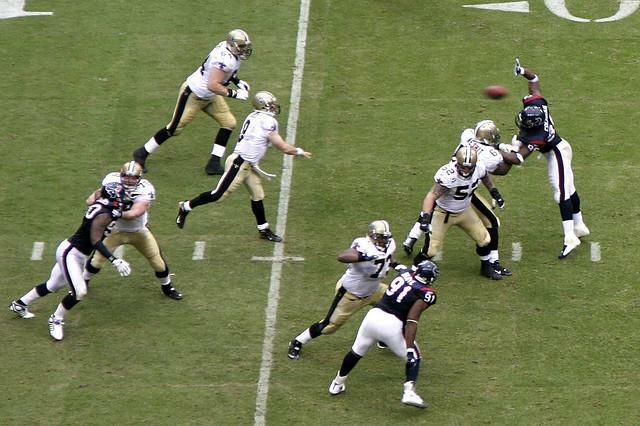 I anticipate Drew Brees starting for at least one team for the RSP Football Writers Project, published this spring. Details below. Photo by eschipul. Secretly, we all want to build a football team. It’s why we’re passionate about every player recruited, drafted, traded, and signed. It’s why we play fantasy football. It’s why many of us are fanatical about the NFL draft. Why not let football writers build teams and write about them? And I want your help. Not a fantasy football league draft in the sense of scoring the teams, but a series of articles where each writer explains the process behind building a complete team of starters, reserves, and taxi squad players on offense, defense, and special teams. After further discussion we decided not to hold a draft, but instead give each writer a list of player salaries, parameters for building a team, and several weeks to make their decisions. Each writer will present his team this spring at the Rookie Scouting Portfolio Blog. Each writer will also answer questions about his personnel decisions, the offensive and defensive systems his team will operate, and the coaching philosophies that jibe with them. Last weekend I approached several writers and every one of them expressed immediate interest with only one of them unable to participate (he just got a sweet gig with the NFL and he’ll be slammed with work). Sigmund Bloom – Footballguys.com writer, the Audible co-host, and co-founder of Draftguys.com. Jene Bramel – Footballguys.com writer and Cincinnati area physician whose expertise with defensive players and analysis of football strategy makes his columns among the most popular on the site. Wes Bunting – The National Football Post writer heads up the site’s draft coverage and prospect analysis. Ben Muth – Ben played at Stanford for five years where he lettered for four years, started for two, and named 2008 first-team All Pac-10 as a senior. After his college career, the San Diego Chargers acquired him, but he was eventually released because according to him, “I was injured, and then not picked up again because I didn’t block that many people when I was healthy.” He’s currently writing at Football Outsiders. Simon Clancy – Clancy is a BBC producer, Sports Illustrated contributor, and worked with Universal Draft’s Chris Kouffman to produce the Cam Newton analysis I reference with Kouffman below. Cian Fahey – Cian is a contributor to the NFL coverage at Guardian.co.uk, writer of the Sports-Central blog for Irishcentral as well as a writer for ffblife and Bleacherreport. Doug Farrar – The Football Outsiders and Yahoo! writer is well-known in the football world for his news coverage and analysis of the game. His podcasts with NFL Films’ Greg Cosell are particularly insightful. Joe Goodberry – Joe is a contributor for CincyJungle.com and a draft analyst with a lot of participation on Twitter. Scott Kacsmar – Scott is a contributor at Football Nation and Pro Football Reference. His projects there included the first ever standardization of fourth quarter comebacks and game-winning drives for NFL quarterbacks. Chris Kouffman – Chris is a draft analyst with UniversalDraft.com and he contributes to Dave Hyde’s blog at the South Florida Sun Sentinel. His co-authored work with Simon Clancy on Cam Newton last winter was terrific analysis. Cecil Lammey – Footballguys.com senior staff writer, Draftguys.com co-founder, and NFL Insider for Front Range Sports Network. Russ Lande – Russ runs the fantastic GM Jr. publication and contributes draft analysis at The Sporting News. Before working for Sporting News, Lande served as a college scout for the Cleveland Browns for three years covering the mid-west region while evaluating all eligible prospects for the NFL Draft. Jason Lisk – Jason is a football and basketball writer for The Big Lead. Ryan Lownes – Ryan is a NFL Draft analyst, enthusiast, and writer for DraftBreakdown.com and Bleacher Report. Matt Miller – Miller is lead NFL Draft Writer for the Bleacher Report. Sam Monson – Sam writes for Pro Football Focus and is well regarded for his strategic analysis of the game. Josh Norris – Josh does work for Rotoworld, NFLDraftScout, and he had an internship with the personnel department for the St. Louis Rams. His analysis is detailed and insightful. Dave Richard – CBS Sports fantasy football writer. Michael Schottey – Associate editor for the Bleacher Report. Dan Shonka – The former long-time, NFL and USFL scout now runs the site Ourlads. Stephanie Stradley – Steph, a self-described “nice and helpful” lawyer, covers the Texans for the Houston Texans Online. Chase Stuart – Chase started a new blog called Football Perspective, which is a must-follow. He also writes for several outlets: Footballguys.com, the New York Times Fifth Down Blog, Pro Football Reference, and Smart Football. His statistical analysis is highly informative and entertaining. Mike Tanier – Mike is a regular of the New York Times Fifth Down blog and Pro Football Outsiders. Matt Williamson – The former NFL scout for the Cleveland Browns and recruiting GA for Pitt is an NFL analyst for ESPN. Yours Truly – I get around. I want you to help me with the questions these writers should answer about their decisions. Keep in mind that they will have a salary cap, they will have to have a complete roster with a quality depth chart for all three phases of the game, and the player salaries we use will force difficult decisions. The writers will also have to explain their offensive and defensive philosophies and how those players fit into the schemes.